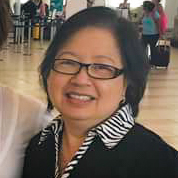 On Thursday, Feb. 1, 2018, Aquilina “Lina” Faustino (nee Aquilina Gonzales Solomon) passed away at the age of 70 years. She will be lovingly remembered by her husband and best friend Leo, their two sons, Randy and Johnpaul, and by her brothers and sisters, Celestina (Amador), Matilde, Connie (Tony), Jane (Joe), Tirso (Tess), Amy (Rolando), and Paul (Leila). Lina will also be fondly missed by her numerous nieces and nephews, extended family and dear friends. The Mass of Christian Burial will be celebrated on Thursday, Feb. 8, at 10:30 a.m., at St. Gianna Beretta Molla Roman Catholic Church, 15 Columbia Drive, Winnipeg, MB, with Rev. Fr. Darrin J. G. Gurr presiding. Memorial donations in memory of Lina may be made to The Leukemia and Lymphoma Society of Canada (LLSC), 804-2 Lansing Square, Toronto, ON, M2J 4P8. A Vigil Candle has been Lit in their Memory.